AKIRA TIMES is the new, sensational kimono image creator from Yamagata in the north east of Japan. 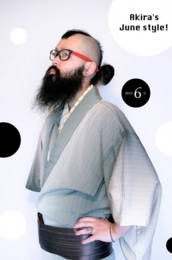 Completely self-taught in photography, computer graphics and design, kitsuke, styling and make-up, he has been posting his online images since 2008, and has attracted a great deal of internet attention. Ignoring kimono rules and conventions and with the minimum of materials, but a whole lot of love, AKIRA enhances the beauty of his models through the kimono.People come from all over Japan to be a part of his work. He continues to strive to produce an image of a perfect Japanese beauty. 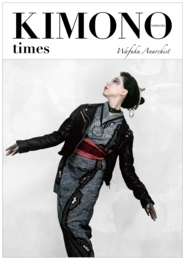 Now, for the first time, KIMONO times and other images by Akira Times are available in print. This exclusive collection represents the best of AKIRA’s ten years working with the kimono.It is comprised of over 120 images, including new material that has not been previously released, and material produced in collaboration with various other artists, such as Mieko Ueda: make-up artist, Rumi Rock: kimono brand and Miyako Godo: hat designer. The book is in full colour throughout, and the introductory text is in both English and Japanese. It has a unique binding, perfect for high quality photographic collections. This book is the definitive item for all fans of AKIRA TIMES. AKIRA was born in Yamagata in 1980. After graduating from junior high school, he has worked on his family's fruit farm. His hobbies were listening to music and drawing pictures. After a sudden and life threatening panic attack, AKIRA changed his lifestyle and began to create images through photography and computer graphics, to bring more beauty into the world.He continues to live in Yamagata and to bring the beauty of the kimono to the world's attention.